It was the first long weekend of the year 2017 and we were in no mood to waste it out on our lazy surreals. We were already scouting for options when dad called one morning, telling us that they were going to Mumbai for an official tour and asked if we would like to come along. Well, that was we were looking to hear anyway and promptly agreed. What needed to be seen was the dent this last minute plan would put to our pockets as train travel was not an option for a quick weekend getaway. I quickly fired my laptop and checked the flight prices and fortunately, there were umpteen deals from airlines and I managed to grab a good deal for our travel dates. So the travel was set and dad was taking care of hotel bookings, in short, we were ready to leave our abode again - this time going off to Mumbai, the financial capital of the country - a city that is believed to never sleep. As planned we packed our bags, traveling pretty light for this short trip, booked the cab and locked the house. We were rushing away from our home by eight on the night of Jan 12th, towards New Delhi's Indira Gandhi International Airport. We were flying Jet from the Terminal 3 and reached the departure area by about 9 PM. We checked into our flight and the process was smooth and fast. The lady handed us the boarding passes and guided us towards the domestic departure's security check area. 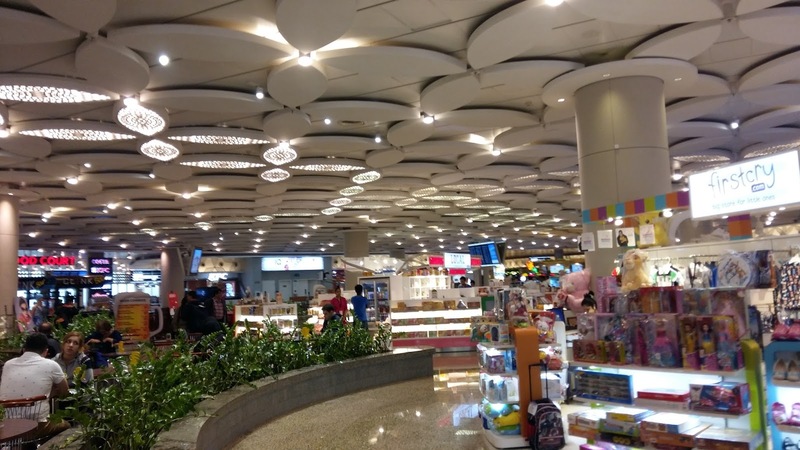 Going through the airport has become a habit until now and we do not give a second look to the shopping zone and food court en route our walk to the Plaza Premium Lounge on the first floor. We checked into the lounge and identified a corner seat to settle our luggage and started our ritual by exploring dinner options. Gladly they had a decent dinner fare and we hogged on the food to give our trip a perfect start. Over food and drinks, we noticed a tall individual pacing with his phone and covering face with a cap. Wifey exclaims that her intuition revealed that person to be Mr. Sonu Nigam, the maestro himself. She takes it onto herself to approach him and he graciously obliges her with a selfie. What was remarkable was the entire episode - he was on a phone call when wifey approached towards him and realizing the situation he excused himself from the call, took wifey's phone in his hands and guided her to a better angle to have adequate lighting and then clicked a couple of pictures - like a perfect gentleman. We could not have asked for a better start of the trip. Soon, we checked the information board and realized it was the right time to leave for the departure gate. At about 10:15, we were waiting at the gate for our boarding sequence. Jet had a zone-wise boarding protocol which worked as intended and everyone was conveniently settled in their seats by the time the aircraft left the airbridge. The usual security announcement ensued and the plane finally took off leaving us with a beautiful view of the glittering night of Delhi. Once in the air, the food service began and they served us dinner - the usual aircraft one to a large extent. The quality I would say was decent but the quantity was seriously short of expectation. Even Vistara, where we weren't satisfied with service, did a good job at the quantity of meal. Probably we are ones with higher expectations. Other than that the service was good and attendants were responsive and prompt. After an hour and a half of flying, the captain announced that we had begun our descent and would be landing in a few minutes. The excitement grew as the plane landed at the Chhatrapati Shivaji International Airport in Mumbai. We had claimed our baggage by about 1 AM in the morning and were proceeding out of the Terminal 2' arrival hall. We just realized that we had landed at the new terminal of the airport which was swanky and chic by any standards - and we had only seen the arrival hall yet. We were already eager to have our experience of departure from this terminal on our return flight. Anyways, we came out of the airport and struggled for a few moments to identify where the cab would pick us. Arrival area is a bit complicated for first timers - the cabs pick you up at parking areas which are themselves at two levels i.e level 6 and 7. Finally, we figured that the easiest way was to ask the cab to pick us from Level 6 parking and we proceeded to the designated location. By 1:45 AM we were zipping away from the airport in this city of dreams called Mumbai. We checked into our hotel by 2:30 and landed on the bed after the daylong exertion. Mumbai, formerly known as Bombay - the name given during colonial British rule, is big and vibrant in many ways and has a unique charm of being known as "the cool or hip city" different from any other place in this vast country. It has been the city of dreams for many and provides an abode to all - dreamers and hard-laborers, starlets and gangsters, stray dogs and exotic birds, artists and servants, fisherfolk and millionaires, and lots and lots of people. While New Delhi is the capital on the political map of India, Mumbai is the financial and entertainment capital of India. With Reserve Bank of India and SEBI, outliers for government departments, setting up their headquarters in Mumbai, the city became the center of all financial activities. The leading stock exchanges work out of here as do most of the financial services institutions. On the other hand, Mumbai is also the home of Hindi Movie Industry, fondly called the Bollywood. This along with the all the other activities related to the fashion world finding their hub here makes it the epicenter of glamor quotient in the country. The city has furious energy, lightning speed, and paranoia metropolitanism. However, amidst all this, the city has its own culture, old-world architecture and spiritual devotion that goes along with it. Entire modernity aside, the city celebrates all traditional festivals with zeal and devotion for religion is astute. During our three days there we found people of the city absolutely gentle, helpful and courteous. Be it the cab drivers, co-passengers in local trains or a roadside shopkeeper - everyone was eager to go the extra mile to ensure we carry only happy memories from the city. Next day, we woke up to a kadak chai at the guest house and had a filling breakfast. After freshening up we went on to meet mom and dad staying at the Hotel Sahara Star, a plush property with nicely done interiors, unique exterior architecture and congested rooms. After a short gossip session, we went onto our exploration of the city. We had planned to have a holy start to the site-seeing session and hence visited the famed Siddhi Vinayak Temple in Prabha Devi area. Lord Ganesha or Vinayak is the god worshiped before embarking on new endeavors and this two-century-old temple attracts devotees in large numbers who come here to have their wishes fulfilled. Fortunately, the rush was on the lower side at the time we visited the shrine and hence had a very good darshan of the deity. The orange colored idol of Ganesha generates enlightenment and piousness and reassures the devotees that their wishes are being heard. After spending some enriching moments in the temple compound, we came out to continue our trip. We drove through the North-West highway northwards towards the Borivali area to have a jungle experience in the Sanjay Gandhi National Park. The national park is an exceptional wilderness spread over 103 Sq. Km. and is wedged between the suburbs of Mumbai and Thane. It is believed to be the largest wildlife reserve in Asia within city limits occupying about 20 percent of Mumbai's geographical area. We took the jungle safari and went through dense vegetation looking for the big cat which kept eluding us and successfully stayed away from our watchful eyes. Though the purpose wasn't fulfilled, the undulating green land, panoramic views of hills and valleys and relatively unpolluted surroundings were a refreshing break from rushed city life. The campus is also the home to Kanheri Cave complex from between 1st century BC and 9th century AD. This complex consists of 109 caves carved out in black rocks and are a center of Buddhist devotion. The major part of 109 caves of Kanheri are simple cells cut in basalt - viharas - cells for monks where they lived, studied, meditated. Few larger cells though are chaityas - halls for congregational worship. The caves involve a short hike up the stairs from where the vehicle drops you and hence a visitor should be prepared to shed some sweat. However, the effort is worth the experience and the views of caves and the surrounding forests are spectacular. We had our lunch at the food court of the Oberoi Mall, on our way back to the hotel. This mall looked tiny from outside but encompassed huge depths in the inside. We went to the hotel for a short afternoon nap before proceeding for evening fun at the Juhu Beach. Juhu is one of the posh residential localities of the city with homes of several movie artists and the beach is sought after destinations. However, childhood memories of the pristine beaches are soon dwindled looking at the clutter and litter this place has today. Insensitive tourists are ruining the very beauty that they have come here to admire. After playful moments with the waves, we saw the numerous eateries clustered in a corner serving local delicacies. We enjoyed a dinner of pav bhaji (curry with bread) at one of these. There is something different in the dish when you have it right on the beach and we loved it to the core. This was the last location for the day and we called it a night. Not really, actually !! We went to enjoy the nightlife of the city at Bandra Reclamation. This is a newly developed area on the northern edge of Bandra Worli Sea link on the lines of the Marine Drive. Next morning, we started the day with a drive across the city - southwards. Our plan was to spend the day in South Bombay, the soul, and heart of the city. This part of the city is the British rules' gift and contains some of the grandest colonial-era architecture on the planet. However, if you explore a little more and you’ll uncover unique bazaars, hidden temples, hipster enclaves, and India’s premier restaurants and nightlife. Our first destination was the Gateway of India. The Gateway of India is a monument that marks India's chief ports and is a major tourist attraction for visitors who arrive in India for the first time. The colossal structure was constructed in 1924. Located at the tip of Apollo Bunder, the gateway overlooks the Mumbai harbor, bordered by the Arabian Sea in the Colaba district. The main objective behind the construction of the Gateway of India was to commemorate the visit of King George V and Queen Mary to Bombay (Mumbai). Overlooking the monument is the majestic Hotel Taj Palace - an iconic building with its unique place in the history of the city. After the attacks of 26/11, the hotel has been renovated and the glitter is alluring. There is also a new tower that has come up in the campus which mirrors the Mughal architecture but falls short in meeting the grandeur of the original building. The hotel is as much a part of the tourist map of the city as the Gateway of India itself. While wandering, we looked around for the ticket window, which was nestled in a small corner - the place we bought ferry tickets for the Elephanta Caves. These ferries are motorboats that take you across the Arabian Sea onto an island housing these historic caves. We took the boat and were fortunate to not have to wait long given it was a weekend. As the boat started, we had an awesome view of the Mumbai Skyline and the Shoreline with high rises lined across the sea-shore. The mighty Gateway and the Taj in a single frame provided a picturesque scene. As the boat crossed the islands, the offshore oil fields, and the signaling towers, we kept clicking pictures and kept enjoying the ride on the sea-waves. After about an hour-long ride, we anchored on shores of an island and disembarked the boat. As we landed on the jetty and moved towards the caves through the long channeled bridge, we realized that it was an exhausting site to be at. One walks about half a kilometer through the bridge and then climbs about 100 steep stairs to reach the caves. However, once you are there the gigantic caves are capable of humbling you with their sheer size. Elephanta represents the pinnacle of rock-cut architecture and sculptural art medieval India achieved. Despite the mindless destruction, Elephanta's art suffered during the colonial past, it still reserves the right to awestruck any ordinary visitors. These are by far the most enigmatic heritage sites I have been to. On our way back, we picked a few souvenirs and rode the toy train through the bridge leading to the Elephanta Pier, where jetty is located. 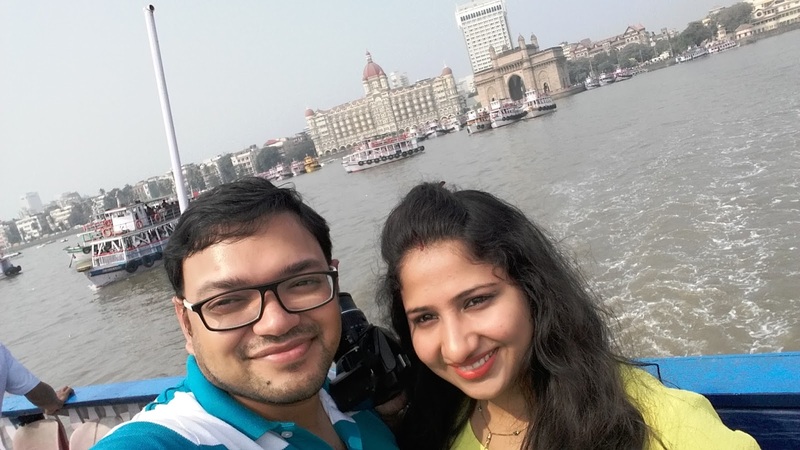 Another hourlong sojourn through the sea landed us back at the Gateway of India. It was almost the lunchtime and after a short lunch break, we decided to take a tour of the South Bombay reliving old memories. We went for a quick look at our old apartment building and went through the busy market lanes of Colaba - locating Maratha Store, Cambridge Shirt Outlet and Keshav's. Later we took a glimpse of the Churchgate Railway Station - given a contemporary look with metal frames and glass panes. We passed through the Bombay High Court and other colonial building on our tour. One of the interesting places we covered was the Flora Fountains. Flora Fountain, also known as 'Hutatma Chowk' since 1960, is declared as one of India's Heritage structures. Built in 1864, this tourist spot houses India's prestigious fountain, located in one of the busiest shopping areas of the city. The name 'Flora' is derived from the name of the Roman Goddess of Flowers. The old statue of a lady in white still exists but the focus has been taken over by a new statue of a lady in black at the top. The old statue is sadly in a dilapidated state showing the apathy in preserving our historic sites. At the end of the tour, we spent few moments at the forecourt of the Victoria Terminus, now renamed at Chatrapati Shivaji Terminus. The building is a UNESCO World Heritage Site and a historic railway station located in the heart of Mumbai. Built in 1888, the station is a grand reminder of the British Raj in India and still one of the most historical landmarks within the Central Business District of Mumbai. The building carries a statue of Queen Victoria on the top. The complete construction of the building took ten years, which was the longest time taken by any building of that era in Bombay. It was opened to the Queen on her Golden Jubilee in 1887 and was the most expensive building in Bombay, which then cost about 260,000 Sterling Pounds. It was already late evening roaming various tourist spots of the city and it was the perfect time to head to some relaxing moments at the Marine Drive. The four-kilometer stretch of paved footpath and road by the sea is the most treasured destination to spend evenings for every age group. The road has recently been renamed as Netaji Subhash Chandra Marg. You can see a plethora of activities across the belt which provides mesmerizing views of the shoreline, especially once the darkness falls and the buildings put on their glittering lights. The entire line of building with their twinkles give the stretch a look of pearl necklace giving the road Queen's Necklace. We spent leisure movements sitting on the parapet by the sea and reminiscing the good time we were having in the city swaying in the cool breeze. Later we walked along the sea to where the drive ends - the sandy beach called Chowpatty located at the foot of posh Malabar Hills. The beach was earlier infamous for litter but was surprisingly clean this time, better than its counterpart in North Bombay - Juhu. In late evenings, it looks like a colorful fair with umpteen shops and eateries. We enjoyed some snacks which doubled up as dinner and had fun to mark our last evening in the city. By about 10 in the evening, we took a cab back to our hotel. The drive across the evening traffic was long but interesting going through numerous landmarks across the city. On the way, we stopped for a quick tour of Haji Ali Dargah. The dargah is the complex housing the tomb of the Muslim Saint Pir Haji Ali Shah Bukhari (R.A.). Along with the tomb, there is also a Masjid within the complex. Situated about 500 meters off the coast, this monument has been the sentinel to the shores of Mumbai for a long time. The dargah was decorated beautifully with colored lights and looked ravishing from the shore. Next, we stopped for a while at the Worli Sea Face, which provided great views of the sea and the newly built Bandra-Worli Sea Link. Spanning across the arc of Mumbai's coastline, this sea link is a civil engineering wonder that reflects the modern infrastructure of the city of Mumbai. Officially known as Rajiv Gandhi Sea Link, this eight-lane cable-stayed bridge is a connection between North and South Bombay across the Arabian Sea, away from the city rush. After initial mishaps, the link has been barricaded on sides which hinder the views of the sea to some extent but still provides a thrill of crossing the seas under the starlit sky. We were snug in our cozy bed by about 11:30 in the night. Next day, we woke up early for our 9 AM flight out of Mumbai. We were at the swanky and aesthetic Terminal 2's domestic departures section by 7:30 AM. 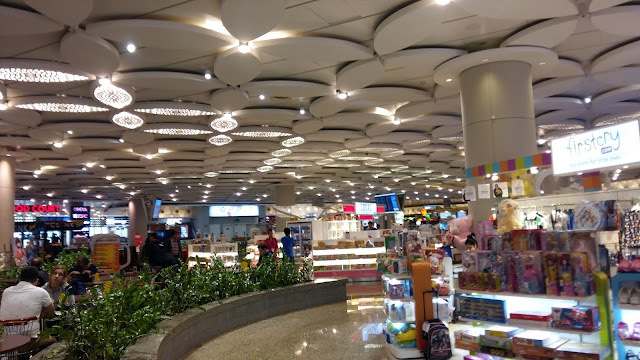 We spent the hour we had before the flight exploring the airport closely and admiring the beauty - overtaking Terminal 3 of IGI Airport in New Delhi in terms of covetousness. We also paid a quick visit to the American Express Lounge for sake of experience and it was definitely a good resting ground for those taking a flight from here. We boarded our Air India flight right in time and took off by 9:10 which was commendable given the credential that the airline is infamous for. The service was decent and the staff was courteous and available. The meal service was functional and the food was generous. We landed at the IGI Airport at about noon, with half an hour of delay, thanks to the morning fog leading to schedules being haywire. We reached home in another hour and settled on the couch, remembering the fun moments from the trip and mentally preparing for the office-day which was only hours away.